Figure 1. 10 known TK ligands from the PDB. Figure 2 shows the binding-site phamacophores and ligand preferences that were identified by superimposing ten crystal structures of TK shown in Figure 1. Three binding-site pharmacological preferences and interactions were identified and circled as A, B, and C. A stack force binding area (Y172-ring) was also indicated. The dash lines indicate the hydrogen binding. According to these observations, we added following pharmacological weights: Q125-OE1 and Q125-NE2 are hydrogen bonds with weighted value 4.0; Y101-OH and E83-OE2 are hydrogen bonds with weighted value 2.5; and six C atoms of Y172-ring are stack force with weighted value 1.5. These weights were used for calculating the value Epharma. For TK ligand preferences, the number of electrostatic atoms was set to two because all active ligands (Figure 1) have no charged atoms. The hydrophilic preference was not assigned in this target. Therefore, WPhb is zero and WPelec is 20 if the number of charged atoms inside a ligand was more than 2. Figure 2. Binding-site phamacophores identified by superimposing 10 crystal structures of HSV-1 thymidine kinase shown in Figure 1. We docked all 10 TK ligands into the reference protein (1kim) and the results were shown in Table 1. During flexible docking GEMDOCK obtained similar results whether the phamacophore preferences ( i.e., Epharma and Eligpre) were considered or not. The docked conformations with RMSD values less than 1.5 for seven pyrimidine-based ligands. On the other hand, three purine-based ligands (i.e., 1ki2.GA2, 1ki3.PE2, and 2ki5.AC2) could not be successfully docked into the x-ray poses because the side-chain conformation of GLN125 in the reference protein 1kim differs from the ones of these purine-based complexes, i.e., 1ki2, 1ki3, and 2ki5. GEMDOCK was the best among these four competing methods (GEMDOCK, GOLD, FlexX, and DOCK) on this test set. a The four characters and three characters separated by a period denote the PDB code and the ligand name in the Protein Data Bank, respectively. b The number of the atoms that may form a hydrogen bond; i.e., the atom type is either both, donor, or acceptor. c The number of hydrogen bonds formed between the ligand and the protein was derived from the native crystal conformations based on our scoring function. d These results were directly derived from Journal of Medicinal Chemistry, 43:4759-4767, 2000. 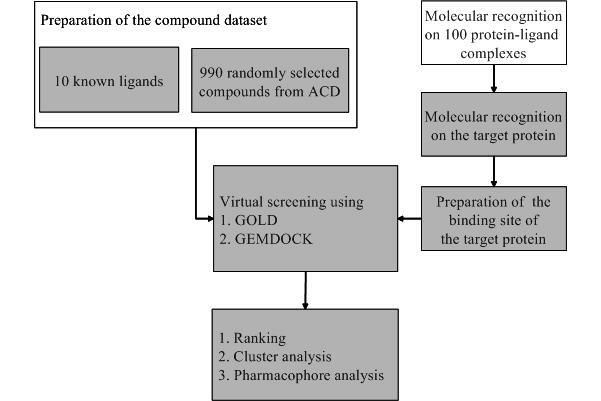 This screening set, including 10 active and 990 random ligands proposed by Bissantz, was used to evaluate the performance of three docking tools (DOCK, FlexX, and GOLD) with different combinations of seven scoring functions. The results of the comparison are also shown in Table 2.
a These results were directly taken from Journal of Medicinal Chemistry, 46:499-511, 2003 and Journal of Medicinal Chemistry, 43:4759-4767, 2000.
b The false positive rate from 990 random ligand (%). The Epharma and Eligpre were applicable to both molecular docking and ligand scoring in virtual screening. Figure 3 shows the results of GEMDOCK using different combinations of phamacophore preferences that are ligand preferences (Eligpre) and binding-site phamacophore (Epharma). We tested GEMDOCK on different combinations to evaluate the program's performance and to observe the search behavior. GEMDOCK generally improves the screening quality by considering both ligand preferences and binding-site phamacophore weights although we did not attempt to refine any parameters of these combinations. The binding site phamacophores seem more important than ligand preferences. As shown in Figure 3, the hit rates of GEMDOCK for different combinations are 38% (both), 12% (ligand preferences), 13% (binding-site phamacophore) and 7% (none) when the TP rate is 100%. Figure 3. GEMDOCK result for true hit against ranking.